CD reviews: "100 Years of Duke Ellington," "Thank You, Duke! ", "The Other Side of Ellington," "Caravan: The Jazz Giants Play Duke Ellington" and "Joyful Noise: A Tribute to Duke Ellington"
These reviews first appeared in the November 6, 1999 edition of the American Reporter. As the centenary celebration of Duke Ellington's birth starts to wind down, the number of recordings celebrating his life and work continue to pour forth. And why not  Edward Kennedy Ellington was that rarity, a musical talent remembered both for his swinging big band and for his (and his band members') compositions. While his band continues on, now under the leadership of his grandson, it is his songs that continue to inspire other musicians. The European Broadcasting Union Jazz Orchestra takes a different (and effective) approach to honoring Ellington. Their live tribute opens with a 31-minute medley of 17 of Ellington's best-known songs ("Take the 'A' Train" by Billy Strayhorn, "Satin Doll," "Mood Indigo," even Harry James' "I'm Beginning to See the Light"), and then explores lesser-known Ellington pieces such as "Purple Gazelle," "Harmony in Harlem" and the four-movement "Togo Brava Suite." There are also two tracks written in honor of Ellington by Andrew Homzy, the first and fourth movements of "Cent-Ellington." This is a crack 16-piece big band, and it lends Ellington's music that full, rich sound that only a real big band can. It might not swing quite as much as the recent Ellington tribute by the Count Basie Band (now led by former Basie sideman Grover Mitchell), but how many bands can keep up with the Basie outfit? "Thank You, Duke!" from Arkadia Records is billed as being by the Arkadia Jazz All-Stars, but in reality there is no such combo. Instead, this is a compilation of Ellington songs as performed by various artists on the Arkadia label for their own recordings from the past few years. While a bit confusing in the labeling department, this disc is an outstanding collection of music. When you have artists of the caliber of Dr. Billy Taylor, Harold Land and Benny Golson  jazz legends every one  featured in recent recordings, you know you're going to get some of the most insightful readings of the Ellington book available. Golson's interpretation of "Don't Get Around Much Anymore" is both respectful and explorative; just getting to hear that sweet, fat tone of his on tenor saxophone is joy itself. He also tackles "Mood Indigo" to similar results. Taylor, now in his 70s, played with Ellington early in his career, which brings a certain authority to his solo piano version of "In a Sentimental Mood." This is pure Taylor, using the composition as a springboard for his musical visions and revelations. Saxophonist Harold Land's orchestral version of the same song a few tracks later is much lusher than Ellington would have played it, but equally beautiful. The ten tracks on the disc are rounded out by saxophonist T.K. Blue (Talib Kibwe), pianist Joanne Brackeen, the Joe Henderson Project and European bassist Joris Teepe. It's all of the highest caliber and, if only rarely drawn stylistically from Ellington's own charts, shows the incredible variety of interpretations that Ellington's songs lent themselves to. Palmetto Records began life as a vehicle for musicians Jeff Berman and Matt Balitsaris to publish their own releases. Of late, though, it's been taking on other artists and moving from the "smooth jazz" of Berman and Balitsaris into heavier, more mainstream music. One of these new releases is a tribute to Ellington by the quintet of Matt Wilson on drums, David Berkman on piano, Joel Frahm on reeds, Ben Allison on bass and Pete McCann on guitar. It's a more contemporary reading of Ellington than most tributes, and contains far more obscure Ellington tracks than you're likely to find elsewhere. Where else will you find "Wig Wise," "Blues in Blueprint," "Skrontch," "Mount Harissa" and "Fleurette Africaine" on the same disc? There are the old familiars as well: "I Got it Bad (And That Ain't Good)," "Take the 'A' Train" (in both trio and duo formats), "Don't Get Around Much Anymore," "Ad Lib on Nippon." The results are not always what one would expect: If you're in a nostalgic mood, this wouldn't be the release to listen to. But for hearing what talented musicians can do with well- written music, it's pretty darn interesting. As with all The Jazz Giants Play ... releases, "Caravan is drawn from the catalogs all the jazz labels Fantasy has acquired over the years, including Prestige, Riverside, Pablo and Milestones. The artists on this 14-track Ellington compilation include Joe Pass, Miles Davis, We Montgomery, Zoot Sims, Sonny Rollins, Clark Terry and Art Tatum  plus one track from Ellington himself and three others by longtime sideman Johnny Hodges with Benny Carter. The results, as might be expected, are wondrous. Rollins' version of "In a Sentimental Mood," Tatum's "Caravan," Sims' "Main Stem"  all approach that intersection of art and inspiration where magic resides. Don Sebesky's been on a bit of a tribute tear of late; last year, he released an album of material by Bill Evans. Sebesky plays the role of conductor here, overseeing a big band with a rotating cast of jazz all-star soloists including guitarist John Pizzarelli, saxophonist Phil Woods, trumpeter Tom Harrell, trombonist Phil Woods and pianist Jim McNeely. 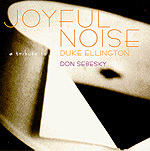 As stated in his liner notes, Sebesky's intention here is to present Ellington's work in completely new arrangements  different time signatures, changed keys, wildly extrapolative solos. he end result is an album that is more avant-garde than any Duke Ellington tribute that comes to mind. 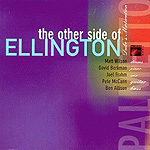 Ellington is only the starting point  everything else is Sebesky and crew. Which isn't to say things get weird here; Sebesky keeps a handle on each song; and the players don't ever stray completely away from Ellington's themes in their solos.